Hear Ye, Broadway! 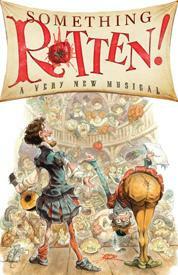 From the co-director of The Book of Mormon and the producer of Avenue Q comes something original... something fresh... Something Rotten!, a world- premiere musical comedy about the musical comedy that started it all. Welcome to the '90s — the 1590s — long before the dawn of premium tickets, star casting and reminders to turn off your cell phones. Brothers Nick and Nigel Bottom are desperate to write a hit play but are stuck in the shadow of that Renaissance rockstar known as "The Bard." When a local soothsayer foretells that the future of theatre involves singing, dancing and acting at the same time, Nick and Nigel set out to write the world's very first MUSICAL! But amidst the scandalous excitement of Opening Night, the Bottom Brothers realize that reaching the top means being true to thine own self... and all that jazz. With its heart on its ruffled sleeve and sequins in its soul, Something Rotten! is an uproarious dose of pure Broadway fun and an irresistible ode to musicals — those dazzling creations that entertain us, inspire us and remind us that everything's better with an exclamation point!